According to Mother Goose little boys are made of “Snaps and snails, and puppy-dogs’ tails;” I wouldn’t necessarily say that this is the case but having grown up with 2 brothers I found they were usually smelly and uncommunicative. These days though I find young boys tend to be more interested in what their friends are up to than sitting still and are more likely to be doing some form of sport, outdoor activity or playing computer games. It’s a real rarity to find an 11-year-old boy who wants to follow an artistic path in his spare time. You can imagine my surprise then, when I received an email about an 11-year-old boy who loves fashion and was looking to learn more about it. My first introduction to Jake came through his blog “The Colour Freak”. You really get a feel for his flair and love of creativity through his writing. He had clearly been designing for a while and from talking with his mum we established a programme that would enable him to learn the process from design through to finished garment so he could make one of his drawings come alive. As with any creative process the design developed as we went, as he came up with other ideas that he wanted to add or established new ways of doing things. I have to say though, putting the original drawings and the final dress side by side, there is no doubt that they are the same dress! I think one of the things I’m particularly pleased about is that he has been allowed to follow his passion and talent. When I was at school a lot of my friends wanted to study art/technology and weren’t able to because their families were pushing them to follow a more academic route. It’s a situation I come across a lot, and it saddens me hugely. I was really lucky that I had unconditional support for whichever path I chose to follow, and Jake is in the same boat. He has so much support from not only his family but also from his school, it really is a lovely thing to see and one of those things that can sometimes be taken as a given. Here are a series of photos of the journey he took through the sessions. From the initial design, to design development, pattern cutting, toiles, and then sewing up the final dress. As a designer you find inspiration in the most unusual of places sometimes. Jake’s inspiration for this dress came from a lampshade. The ability to find inspiration and then translate it into designs is what separates a designer from a sewer. I have found working with Jake hugely inspiring for me, its funny the restrictions you put on yourself without even considering. For years I have thought that pink and green should never be seen (of course not even the original colours from the saying) and yet there is something about the way these colours work in Jake’s dress that I just love. It has a sort of “little mermaid” feel about it. I love my teaching, its amazing to see the joy that sewing brings me come alive in other people and teaching Jake has been no different. He has the talent to make a real name for himself in the design world if he chooses to pursue it as a career (which I really hope he does). When I consider the types of garments I was sewing aged 11 they were nothing as complex as this. He has achieved so much in such a short period of time it is really quite remarkable. When I have the time I would like to develop this design further to see where I can take it in an homage to this amazing designer. 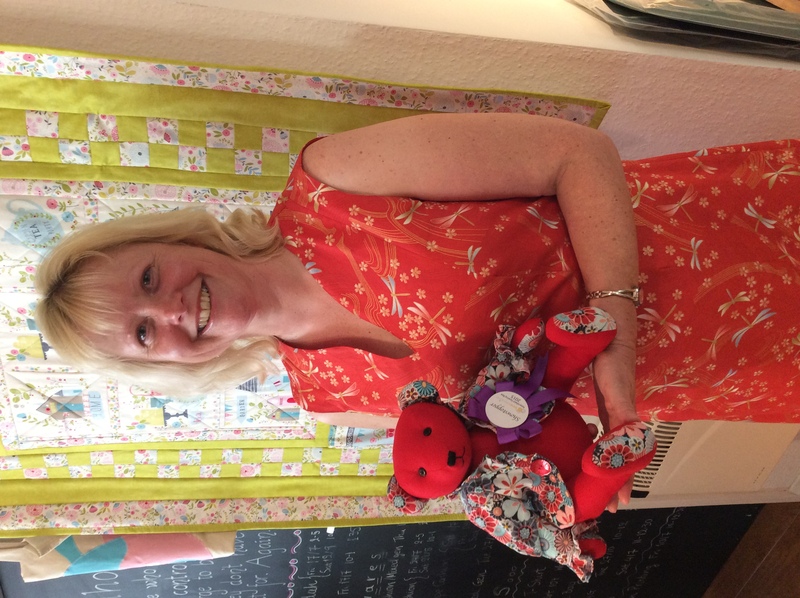 I recently had the pleasure of being involved in the “Great Petersfield Sewing Bee” competition run by Sew Creative. As one of the judges, I got a close up look at all of the entries submitted and to say I was blown away is a huge understatement. The competition was split into 2 groups, one for the children to compete in and one for the adults. Each competitor had several challenges to complete. The children’s challenges were to embellish a t-shirt, follow a pattern to make a stand for a tablet and then create and decorate a book cover. Whereas the adults had to be creative with 2 fat quarters, make a garment for a child from a pillowcase, create a patchwork cushion and make a zipped bag. When the first set of entries started to arrive, we knew we were in for a difficult judging. Everything submitted was of such a high standard, picking one winner was going to be an impossible task. We split the marking into categories and awarded points depending on how well we thought each submission fulfilled them. Some of the categories we judged each entry on were creativity, skill and use of fabric. As well as scoring each entry we gave commendations to those submissions that we just loved, regardless of how it scored. This meant that many different awards were given with 2 overall winners. I wanted to share with you some photos from the competition including some of my personal favorite submissions. 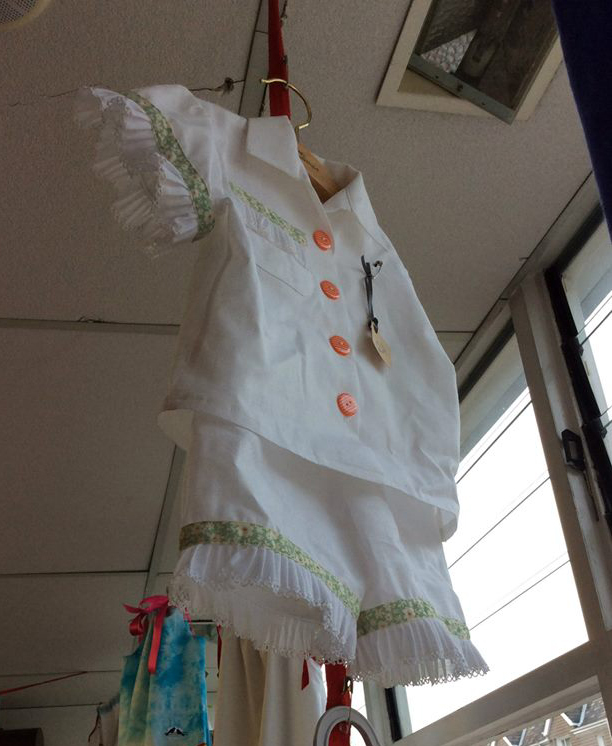 Every time a submission deadline was reached the window in the shop was filled with beautifully made items. 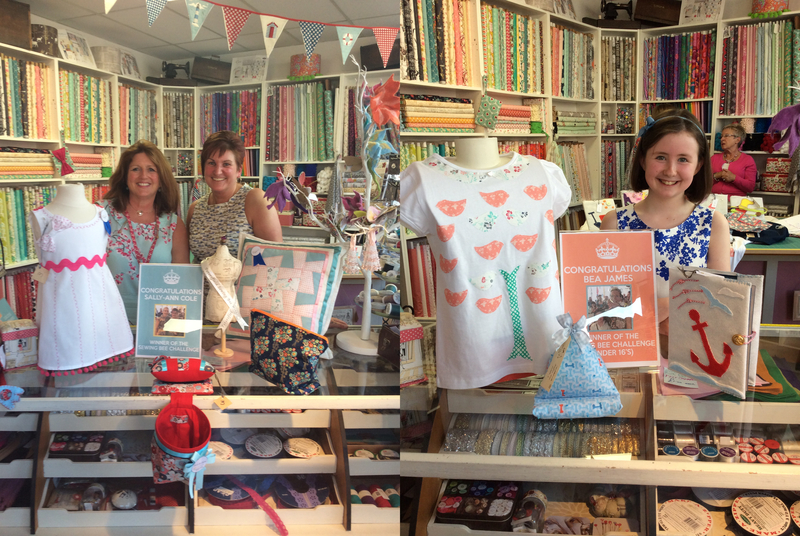 It was such a delight for everyone who passed by or visited the shop. The challenges inspired not just those people who entered but everyone who saw what had been done as well. 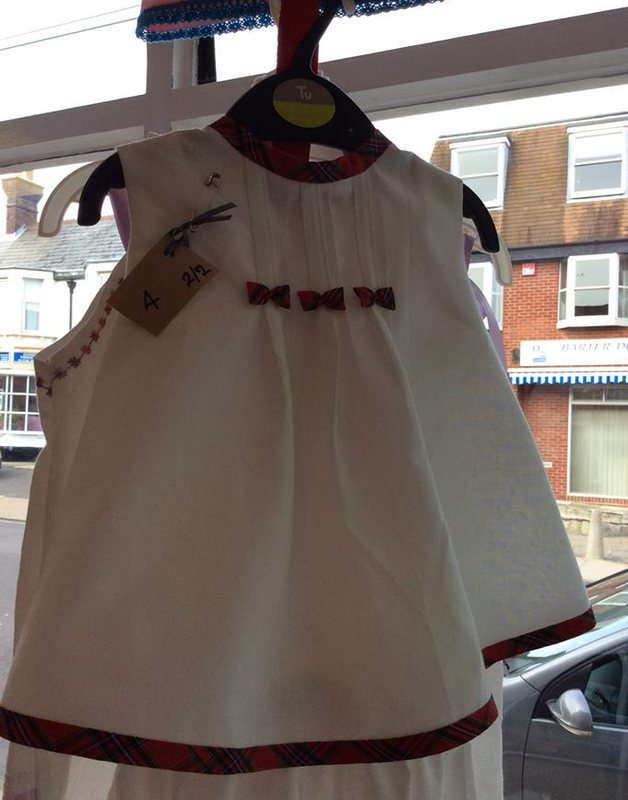 I just loved the use of tartan trim and the pleats on this beautiful little dress. Sometimes, it’s not always about going for something hugely complicated, but doing simple flawlessly. These were a set of pyjamas submitted that I can honestly say I would pay good money for in a shop. The detail combined with the impeccable execution was something to behold. Lottie the bear was my favourite item across the entire competition. I just fell in love with her. With her jointed limbs, beautiful sewing and incredible little jacket she was just a little gem. I have requested the pattern for her from her fabulous creator and I just can’t wait to make one myself. I would just like to again congratulate the 2 very worthy winners Sally-ann Cole and Bea James. It was an absolute pleasure to be a part of such an amazing competition and I am already excited about next year! At 28, I’m commonly told that I am a lot younger than my clients were expecting me to be. Dressmaking seems to have become a profession that is more synonymous with “little old ladies” than it is with people my age. Even with this in mind though, at what is seen as a “young age” I still manage to hold over 10 years of sewing experience, a degree in fashion design and over 5 years under my belt running my own business as a designer and dressmaker. It’s odd though, because if you mention the term “Fashion Designer” age doesn’t seem to be a query, the expectation is just that I must surly work in London for a major label or brand. It’s funny, because that is something I actually ruled out as a career from quite early on. I love the freedom that working for myself gives, not having to answer to anyone other than the client when it comes to creative decisions. I experienced early on in my career that working for fashion brands is creatively constraining because there are always people above you to overide and change designs/decisions. Plus, as much as I love to visit the city, the countryside will always be my home. So that is how I reached this point, as a young designer/dressmaker living in the countryside and working for myself. Breaking a lot of misconceptions, but being no-less qualified, skilled or successful. I’m lucky though, the only reason I got to where I am is because I was taught a set of skills as a child that set me up in life (a fact my mother regularly reminds me that she is responsible for). When I fell in love with sewing and fashion I was actively encouraged to pursue it as a career, a fact I know is not true of a lot of people who want to pursue a life in the arts. No-one could have imagined that the little girl sat at the sewing machine would grow up to become a designer (let alone me), but I came from a family where it was never ruled out. As Napoleon Hill so aptly put it “You are the master of your destiny”, and I have definately been allowed to be mine. So hopefully I’ve intrigued you and you’re interested to read more. My plan for this blog is to provide some insights into my world. 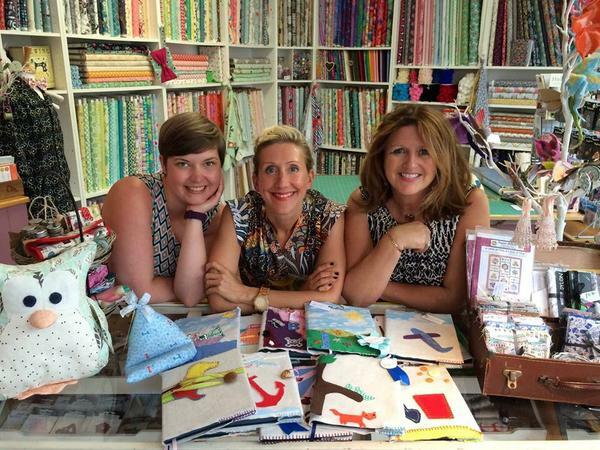 Have you ever wondered what goes on in the day to day life of a professional dressmaker? What exciting things I’ve been getting up to? What we do on our days off? What problems I encounter and how I solve them? I also plan to do a few sewing tutorials, that include tips and tricks about specific sewing tasks and hopefully keep you a little entertained on the way. Please feel free to let me know if there is a specific subject you’d like me to blog about and I’ll do my best to try and cover it.